Just when you thought the Kodak name was dead, another company revives it by licensing its name. This year's rebirth comes in the form ofa smartphonefrom Bullit group, a company behind the Ministery of Sound and Ted Baker audio gear, as well as CAT's recent smartphone offerings. It's called the Ektra, after the famous 1941 Kodak Extra, and obviously, the main focus here is photography. The Bullit Group are aware that this is a niche proposition - not everyone wants a chunky smartphone with a large protrusion - but this isn't for them, it's for the photography enthusiastwho wants to take amazing images on their phone. The Ektra features a 21-megapixel sensor with an f/2.0 lens aperture. On paper,that should produce more detailed images that the 12MP units found in other flagship smartphones. We're not sure how large the sensor is, though - but we're guessing it's not a 1-inch sensor like the Panasonic CM1. The rear camera also packs phase detection autofocus points, optical image stabilisation, and a dual LED flash. Maybe the key here is the software powering the camera. This comes from camera software experts Arcsoft. For example, using Arcsoft's Night Shot technology (combined with a Kodak certified lens coating) to reducing ISO noise, brighten underexposed areas, and stabilising blur from slow shutter speeds. This is the stuff that powers cameras from Nikon, Panasonic, and Olympus, so they know what they're doing. There's also a powerful manual mode built in, allowing you to adjust settings with pleasing haptic feedback built in. Away from the camera, other specs includea Helio X20 2.3GHz Decacore processor with 3GB RAM, 32GB storage (expandable with MicroSD cards), and a 3000mAh battery with USB-C fast charging. What were our first impressions of the smartphone? It's got an attractive industrial design, and it's comfortable to hold, but the camera seemed slow to focus and take images. It was pre-production software so this may be fixed. The Ektra runs Android 6.0, and comes with Snapseed preinstalled for photo editing. There's also a Kodak app called Super 8, which adds vintage film filters to your snaps and video. Finally, becauseKodak is all about physical photographs, there also an app which allows you order photos directly from your camera rolland have them posted to you in the iconic Kodak yellow envelope. 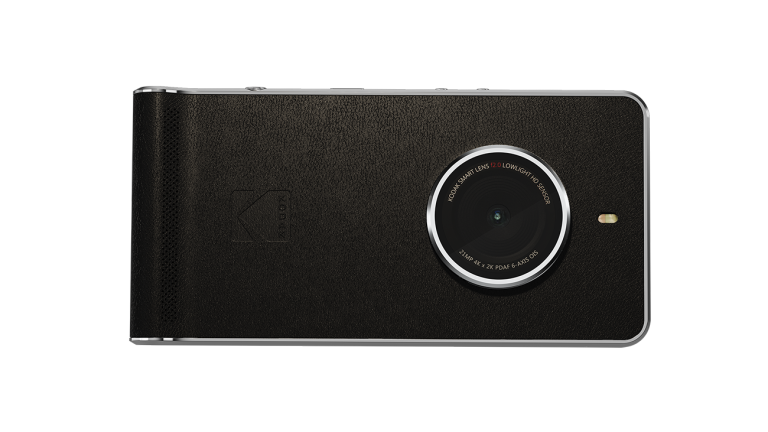 The Kodak Ektra will cost £449, and be available across Europe later this year.